Designers take great care to choose the right products and systems for clients. However, no matter how discerning the specifier and regardless of product selection, if the design is installed incorrectly the customer will suffer. The product will not perform the way the designer intends and dismantling and replacing the installation is expensive, time consuming, and can tarnish the image of everyone involved. That’s why no one has greater influence on the success of floorcovering designs than the installer. At NeoCon 2018, INSTALL and Roppe will emphasize the value of certified installation through live, daily flooring demonstrations. As the largest commercial interiors show in North America, NeoCon 2018 will be held at Chicago’s historic Merchandise Mart from June 11-13. The INSTALL and Roppe demonstrations will be located on the 7th floor at the Interiors + Sources Materials Pavilion # 7-1000. Envire™ Rubber Sheet & Tile: designed for a natural resilience, exceptional wear resistance and dimensional stability for high-traffic areas. 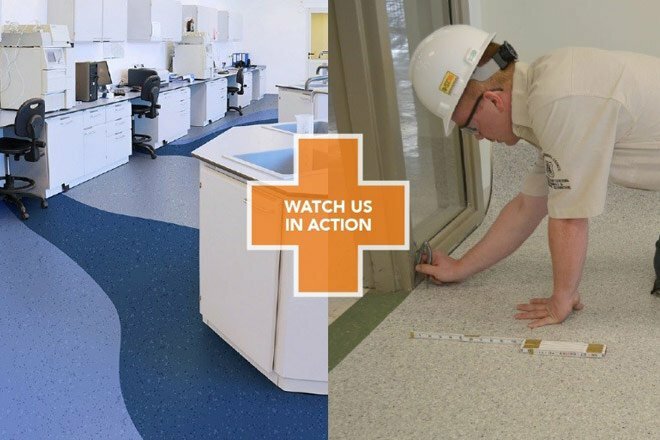 FlashCove™ Prefabricated Base: puncture-proof reinforced base for the longest life-cycle and easiest maintenance for sheet flooring installations.